Start with Judy Garland. In her wardrobe tests for Valley of the Dolls (1967), a film from which she was eventually fired, she comes across as a charmer—lighthearted, cooperative, problem-free. On her behalf, I want to start campaigning. I want to lobby for a remake of Valley, this time with Garland restored to her role as wig-wearing Helen Lawson, a part that destiny gave to Susan Hayward instead. And I want to militate for a worldwide reinterpretation of Garland, the court of public opinion this time passing a “not guilty” verdict on her depressive tempestuousness. Garland screentests my eligibility for the role of interpreter who rescues tarnished goddesses, though Judy may now wish to excise me from her posthumous entourage. Barbara Lapsley, star of George Kuchar’s I, An Actress (1977), is no Garland, but she rivals Gena Rowlands. Repeatedly, Kuchar violates the firewall between director and actor; he wants to teach Lapsley how to emote, how to clutch her breasts, how to writhe on the floor. Maybe she is preparing for an audition, or maybe the audition has already begun. Maybe the audition has ended, and now she is actually playing the role. Maybe Kuchar is the real actress, the film’s “I.” Watching, we aim aggression at the wig and coat propped like a scarecrow on a chair; wig and coat are stand-in for Lapsley’s co-star. Maybe our aggression is being screen-tested. Each time the wig falls on the floor, unmasking a charade that doesn’t need unmasking, my heart leaps with elation, as Wordsworth’s heart leapt when he saw a rainbow. But there’s a photo—“of many, one”—that unnerved me as a child, and I can’t help but mention it now: the photo, appearing in Joe Morella and Edward Epstein’s 1969 compendium, The Films of Judy Garland, supposedly shows Judy as gingham-clad Dorothy in Kansas, but the girl in the photo looks like a wax-museum replica of Judy, or like a different child actress—say, Deanna Durbin’s unknown sister, living incognito in a Nevada ghost town. Perhaps the photo is a publicity still, or perhaps it is a fraud, engineered to send us downward into a vortex of identity-undecidability. Here is how artist Eileen Maxson describes the premise of her video Tape 5925: Amy Goodrow (2002), in which she stars as (to quote from the artist’s website) “an asocial college student with a secret” who “submits an audition tape to the Real World.” This screen test’s highlight is the syncopation that Maxson’s mouth and eyes enact: eyes and mouth move at cross purposes. The mouth announces nerd identity; but then the eyes twinkle, rescuing the face from nerd purdah. Irony flashes up from somberness, one gleam at a time. Maxson (playing Goodrow) obeys an irony-rationing edict: in hard times, the government apportions only a few instants of irony per month to each citizen. Have you noticed that many young people these days keep their faces numb and expressionless? Maxson allows me to understand that beneath a neutralized face may lie volcanic intensities. My daft assumptions about affect deficits are screentested by Maxson’s tour de force. I don’t have much to say about McDermott’s and McGough’s uncanny Alice Campbell’s Hollywood, 1938, except to speculate that the name Alice Campbell might have something to do with Warhol’s Campbell’s Soup and with Frank E. Campbell’s Funeral Home (Garland’s and Rudolph Valentino’s waystation), and to confess that I am still in the dark about whether these screen tests—a mother instructing different child actresses to make a scrapbook from issues of Photoplay—actually come from 1938 or indeed feature the personages listed in the credits (including the recognizably 1980s art-world Stella Schnabel, Lois Schnabel, and Zena Scharf). McDermott and McDough, as if inspired by the vertigo-inducing projector in Adolfo Bioy Casares’s The Invention of Morel (which engendered Last Year at Marienbad), deny chronology its accustomed sway. The movie’s best line—it gets repeated many times—is the mother’s; with MGM intonations worthy of Norma Shearer, the mother warns the child, “Be careful not to get any scrap paper on the carpet.” I don’t understand this admonition. Isn’t scrap paper easy to pick up? A prohibition against muffin crumbs makes sense, but why deny scrap paper its right to dwell on carpet, in floorboard crevice, or anywhere it wants to reside? 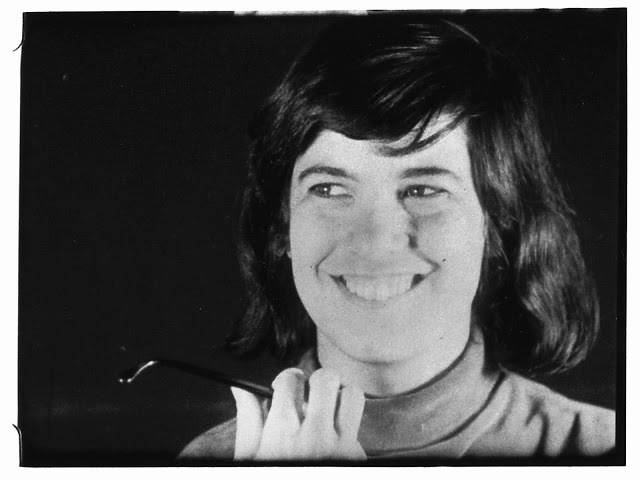 End with Susan Sontag, or Warhol’s two screen tests of her elliptical allure. In my perhaps faulty recollection of these documents, Sontag momentarily tries to keep her face inexpressive—a deadened, behaved face, masking its restiveness. Abandoning impassivity, she unabashedly smiles, a big, awkward, star-envying, North Hollywood High School grin. When you or I can extract a smile from a face that we expect to cast upon us nothing but scorn, ambrosia seems to rain down from the heavens, as Wordsworth or E. Y. “Yip” Harburg, lyricist of “We’re Off to See the Wizard,” might have said, had either man been fortunate enough to read Against Interpretation. An untimely death in 1850 prevented Wordsworth from encountering it; Harburg lived until 1981, so he had a chance. Just now I googled “Harburg Sontag” to see if I could find a rendezvous between these two American Jews (“Susan Rosenblatt” and “Isidore Hochberg” were the disguises they wore when they first entered the universe), but Google showed results for a different search, “Hamburg Sonntag,” Sunday in Hamburg, tips on how to spend your touristic Sunday in the only German-speaking city that Thomas Bernhard, my role model in rant and reverie, truly loved. Copies of Koestenbaum's new collection of essays, My 1980s, will be available for sale.